If you have ever wondered what you need to be successful at affiliate marketing then read on. Obviously you need the practical tools of a computer and an internet connection, but after that, here are my top 10 things I think you need to improve your chance of being a successful online entrepreneur. 1. EFFORT. I honestly believe that you can’t sow tomatoes and expect to grown sunflowers! What you put into something is closely related to what you get out of it and affiliate marketing is not different. There will be a correlation between the effort your put into your business and the rewards you reap. I do not just mean on a monetary level either, since the benefits you get from becoming a successful online entrepreneur are many and varied, such as more free time, financial freedom and a truly location-independent business. If you put a concerted effort into your marketing business, creating an informative and useful website and then focusing on taking one step forward every day, then you will see the rewards. 2. A CAN-DO ATTITUDE/MINDSET. A mindset that is based on a can-do and positive attitude is a must. This is important not only because you will need to work through the challenges that you will inevitably come across in your business (such as frustration, impatience etc) but it is also vital for overcoming challenged in your general life too, which can affect your business. If you look for positive things in all situations, then you will get more positive and successful things in your life. Remember too though that the opposite is also true: if you are constantly thinking that things are going to go wrong, boy, do they go wrong! In order to be successful at anything, you need to understand the rules of the game and then use your wisdom and intelligence to play it to your advantage, but the key thing you need is the knowledge to begin with. As you go forward in your affiliate marketing business, depending on the avenue you have chosen, you may find it more or less difficult to accumulate knowledge but it is vital that you do. The first source of knowledge you have is the internet itself – that is what led you to read this post. There is a wonderful amount of knowledge available online including training programs from individuals, companies and groups of like-minded people setting up marketing groups. You can also search, experiment and research entirely on your own but I would suggest that that is a lonely and unnecessary way to begin. Not only will you have to ‘reinvent the wheel’ but you will miss out on the wealth of experience from people who have ‘been there’ and ‘done that’ who can make your life easier. There are also many books on the subject and you can check out some of my recommended books here. Libraries will stock many good books too so if you are starting on a budget, you can make use of the free facilities in a lot of local libraries. However, I would recommend that you get some training from an affiliate marketing program such as the one I used to create this and other websites. This is through the Wealthy Affiliate program, but there are also a number of other training programs out there that you can check out yourself and see which one fits with you and your circumstances. Read blogs and posts from other members who often post incredible additional training on the finer points of affiliate marketing, WordPress, SEO or other related topics. 4. SOME INVESTMENT. You can start in affiliate marketing with very little – you will need to create your own website and you can do that for free at some platforms or pay for a domain name of your own and create a website that way. This is a perfect way to start out if you have a budget and need to reduce your original outlay. At Wealthy Affiliate and other marketing programs, you can sign up for free and they will give you up to 2 websites hosted on their own program. It is free to sign up to a WordPress blog and learn the ropes that way. However, after a while, I suggest that you invest more money and learn from people who can deliver you a lot of knowledge and tools in a short space of time. That is the reason I signed up with Wealthy Affiliate and I know that other programs out there have similar set-ups to try to jump-start your online business. I started off with a premium membership paying $19 for the first month and then £49 thereafter but I was also fortunate in that I was able to take up the annual membership in a Black Friday sale. That saved me almost $200 over the year so my initial outlay has been minimised but the benefits have definitely been maximised. Changing to the yearly fee reduce the pressure on monthly outgoings and ultimately saved me money. I have invested in 3 of my own domain names (at approx £15 per site) but my investment in my online business has been less than the cost of a take-out coffee but I know that the rewards will be much more long-term than my daily skinny latte. The time this takes will obviously vary from person to person and will depend on how much they know to begin with, your personal situation and the way in which you like to work. For me, I like to write mostly in the evening once my children are asleep, but this will be different for everyone involved. We will all schedule work differently according to where and what we can do. It goes without saying that the more time you have, the more work you should be able to accomplish but that is not always the case if you are a person who lets themselves get distracted by non-important things. There’s an old adage that ‘work expands to fit the time available’ which I think is relevant here however, if you learn to focus well and on the right things, you can do a lot with a few hours a week. It is important to market and use the social media networks available to us but always remember that the majority of your time should be spent on 1) gaining knowledge and 2) applying that knowledge by adding content to your site. 6. PATIENCE. There’s a great saying that goes something like: “You can learn a lot from children – how much patience you have for example!” I love this not only because it is true about children, but I think it links well to anyone starting out in affiliate marketing too. This business will definitely test your patience so be prepared to have it in bucket loads! Some questions that I get asked a lot are things like ‘how long before I make any money?’ and the answer is always in the way of months or years rather than weeks. But don’t let that put you off – just go into the business with your eyes open and manage your expectations accordingly. You can, if you have patience and consistently work productively on your site, reap rewards within a few months. It may not be enough to live on but there are plenty of cases where people have not made significant money for a full year and then things start to pick up. The most common scenario is about 6 months, when the search engines register that your site is trustworthy and useful, they start to rank your articles. Then you get traffic and traffic generally results in income. Remember too that this is a business, YOUR business and any business needs time to become established. Think about how long Amazon took to make a profit (approx 10 years) but look at them now! Your reward will also be related to the time and effort you put in). Some articles can rank in a matter of hours (after an initial period) and others take longer, but overall, your site needs time to settle-in and be trusted, An understanding of the reality of this situation will allow you to have realistic aspirations and not give up before you achieve them. 7. RESILIENCE. This is an easy one – “winners never quit and quitters never win!” One thing is certain that the world will throw you some pretty big curve balls as you go through life but whatever the world hits you with, there is always a way through it. There are multiple stories of people throughout history who have suffered set backs and defeats before finding their success. Think of Walt Disney, Henry Ford, The Beatles, Thomas Edison if you need some inspiration. Where would we be today if they had given up at the first hurdle? The ability to ‘get back up’ every time you fall over is vital. Think of it like this – you never gave up trying to walk just because you fell over a few times as a child so apply that determination to the rest of your life and success will be yours. Missing out on money by quitting too early. 8. COMMUNICATION SKILLS. We are in the business of creating informative and useful content as an affiliate marketer – not in the business of making money! Of course I should qualify that more, because most of us do want to make money and that is one of the main reasons why we start our businesses in the first place. However, if we are simply chasing the money, then it is highly unlikely that we will make a success. We need to remember that we have an audience, our readers, who have a problem they want solved. By visiting our website and clicking on the links we provide, they are looking to solve their problems. Therefore we need to be able to communicate effectively with them in order to do that. That doesn’t require a creative writing degree although I do recommend developing your skills to allow you to write engaging and relevant content. Remember though, that we communicate with friends, family and colleagues all the time – just see your website as an extension of that. You should write your articles in a helpful and friendly manner, interacting and engaging with the audience along the way. The internet itself is a wonderful resource for tools which can help you improve your writing skills. Bookmark a thesaurus, spell and grammar checker for example and you can always enlist a friend or professional proof-reader to look over your articles before you publish them too. I love writing (hence this site) so have a look at some of the links below where I’ve written information to help new writers get started or improve their skills. Remember, CONTENT IS THE MAIN INGREDIENT IN OUR PIE so work on that and remember that with practice, your skills will improve. 9. A DESIRE TO HELP. I truly believe that if you want to succeed, then it will be easier, more pleasant and more satisfying if you also have the intention of helping others. If this is the case, it will reap through your website, your writing and your attitude and your readers will pick this up too. When your posts offer excellent content, you will be ranked higher by the search engines because they too want to offer their searchers content that is informative and useful. Content that is just filled with affiliate links in the hope of making money will rank poorly. So look to help people in your writing and that will in turn, help you. Gratitude too will take you far so always be grateful for the success you have achieved, not matter how small. More will follow. 10. DEDICATION. I love this word because it always reminds me of a UK children’s TV programme that was on in the 1970s called “Record Breakers”. It was basically a programme which was about people trying to break records from the Guinness Book of World Records and followed dedicated people as they became the fastest, strongest of the best at what they did. “Dedication’s what you need; if you want to be a record-breaker” was sung by the presenter, Roy Castle, at the end of each show. I think his words are still important today. If you want to succeed in your online business, then you really need to realise that this is not a sprint but a marathon and you need to understand that it is a long-term business investment that you are making. If you need a get-rich-quick scheme, then affiliate marketing is not for you. However, if you dedicate yourself to your business and put it on a higher priority than irrelevant distractions (think mindless TV, inane gossip and sorting out your underwear drawer!) it will eventually lead to the success you seek. I believe that you can develop all the skills mentioned above. I also believe you can create your own life and your own success – so why not go and get it? If you are new to affiliate marketing and are looking to start then have a look at one of my other posts which will give you some more advice on how to really get your business started for little or no money. Great post and I think you’ve hit the nail on the head here! Many of the things you listed, such as time and resilience sometimes are not taken as seriously as they should be. Your time and ability to pick yourself back up after a set-back or just seeing something through to the end are what can really set you apart from others. Of these 10, which do you think is the trait you struggle with the most? Great post and you are exactly right about the 10 things you need to run a great affiliate network program. The one that I use to struggle with the most was content writing, but now, like you said the more I write, the easier it gets to write. The one thing that I know I am still struggling with is patience, but I just keep plugging along and hopefully I get inspired to write more and do more with my website, this is the way I feel now after reading your post, nice job. Thanks for this inspiring post. So many things I need to keep in mind when I’m building my own website, especially when I wonder if it’s worth it. This is excellent I have an affiliate site that makes sales here and there. Maybe if I implement some of what you’ve told me here. I can bring my commissions up to a higher amount maybe like a couple hundred. Thank you for replying William. I’m glad to hear you have starting in affiliate marketing and that you have a site up and running. Really pleased to hear to that you are making some income. The key is to keep adding your content and trust that the traffic will flow eventually. All the best with your site and please do implement the advice to further your success. Calm smooth website with plenty of relevant content. 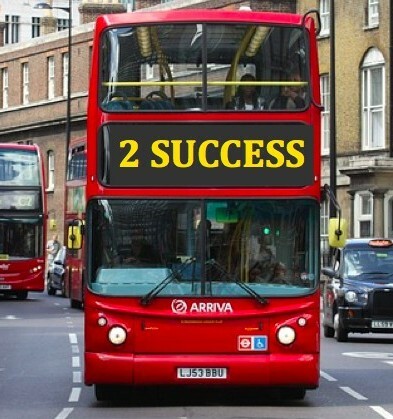 I like the the double decker bus with the ‘Success’ marquee. Thanks for your kind words Harold. Glad you like it. It’s a bus that we should all look out for and jump onto if we can! Absolutely brilliant post. Informative and inspiring to others who are looking to build an online business, like me! I wish you continued success in the online world. Hi Gail. Another great post, very brilliant, I have so much to learn from you! so glad I found your articles. I struggle a lot about writing, but I understand with patience and practice this skill will be easier, I hope !